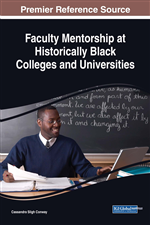 This chapter outlines how historically Black Colleges and Universities (HBCUs) have served an important role in promoting access to higher education for Black faculty when other venues were closed to them. During their inception, HBCUs were far from equal in terms of infrastructure, resources, and operating budgets; these inequities persist to the present day. HBCUs have a rich legacy of producing charismatic leaders. For example, W. E. B. Du Bois, Martin Luther King, Jr., Thurgood Marshall, Ella Baker, Barbara Jordan, and Stokely Carmichael who all valiantly advocated for societal change for all and served as positive role models to many African Americans. Black colleges also provide a rich source of social networks to students, fostering an empowering educational climate (Palmer & Gasman, 2008). Historically Black Colleges and Universities (HBCUs) have served an important role in promoting access to higher education for Black faculty when other venues were closed to them. During their inception, HBCUs were far from equal in terms of infrastructure, resources, and operating budgets; these inequities persist to the present day (Anderson, 1988; Brown & Davis, 2001; Brown, Donahoo, & Bertrand, 2001; Drewry & Doermann, 2004). Despite the lack of resources, HBCUs have a rich legacy of producing charismatic leaders. For example, W. E. B. Du Bois (Equal Rights Educator, Writer, and Advocate for Social Equality), Martin Luther King, Jr. (Christian Minister, Civil Rights Advocate, Nobel Laureate, and Leader), Thurgood Marshall (Civil Rights Attorney, Equal Rights Advocate, and United States Supreme Court Justice), Ella Baker (African-American Civil Rights and Human Rights Activist), Barbara Jordan (Attorney, Educator, an American Politician, and a Leader of the Civil Rights Movement), and Stokely Carmichael (African American Civil Rights Activist, Organizer, and Leader) who all valiantly advocated for societal change for all and served as positive role models to many African Americans. Black colleges also provide a rich source of social networks to students, fostering an empowering educational climate (Palmer & Gasman, 2008). Research supports the notion that HBCUs foster and cultivate “a nurturing and progressive environment designed to stimulate leadership and learning” (Palmer and Gasman, 2008, pg. 53). Despite the rapid and systemic decline in the number of existing HBCUs, “researchers have consistently argued that Black colleges and universities foster a nurturing, family-like environment, and faculty members are supportive of African American students” (Brown et al., 2001; L. A. Davis, 2006; FriesBritt & Turner 2002; Seifert, Drummond, & Pascarella, 2006, as cited by Palmer and Gasman, 2008, pg. 53). African American students at these institutions are more satisfied, engaged in the community, and well-adjusted (Allen, 1992; Fleming, 1984; Fries-Britt & Turner, 2002; Harper, Carini, Bridges, & Hayek, 2004; Pascarella & Terenzini, 2005). Research has also shown that African American students on Black campuses exhibit positive psychosocial adjustments, cultural awareness, and increased confidence (Allen, 1992; Fleming, 1984; Fries-Britt & Turner, 2002). African American students perform well academically, even though some students enter college with academic deficiencies and come from low socioeconomic backgrounds (Allen, 1992; De Sousa & Kuh, 1996; Outcalt & Skewes-Cox, 2002 as cited by Palmer and Gasman, 2008, pg. 53).